Ferdinand Piech’s exit gives Volkswagen room to rethink. Europe’s largest carmaker can ditch the former chairman’s more grandiose growth visions. It can create ample additional value by shunning M&A and focussing on existing strengths, cost control and cash generation. 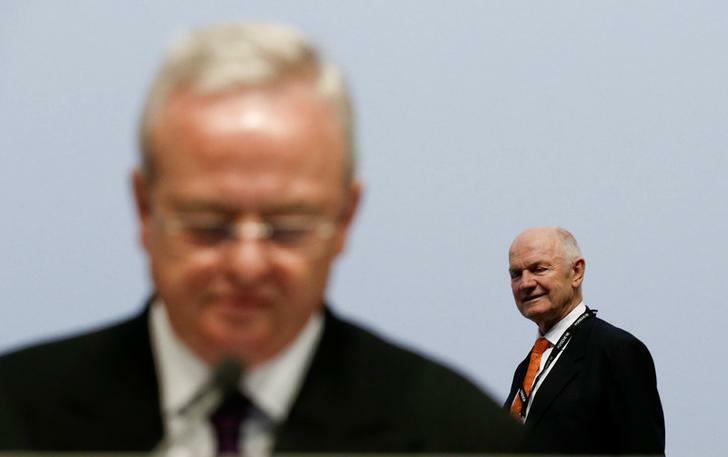 Ferdinand Piech (R), chairman of the supervisory board of German carmaker Volkswagen walks beside President and CEO of Porsche Automobil Holding SE Martin Winterkorn as they attend the annual shareholders meeting of Porsche in Leipzig. Shares in Volkswagen, Europe’s largest carmaker, gained 4.9 percent to 244.45 euros on April 27, on the first day of trading after the resignation of Chairman Ferdinand Piech. The 78-year-old, who masterminded VW’s global expansion and was a towering figure at the German group for more than two decades, stepped down on Saturday after losing a showdown he had provoked with Chief Executive Martin Winterkorn. Deputy Chairman Berthold Huber, a senior trade unionist, will take over until a permanent successor is found.